Steps to Christ in the Pidgin language will soon arrive in Papua New Guinea via ship. Eighty cartons of literature were delivered to Port Moresby and put in the Bond Store. Places were being sought to store this literature until it was distributed. No place could be found. Finally a man who worked at the main prison suggested that the literature be stored at the prison. It did not seem like a good place to store literature because the place was full of thieves. But would it be such a bad idea? If the literature got stolen, it would be in the hands of the prisoners! We finally made arrangements to store the literature at the prison. There was one condition to renting this space. Each new prisoner would get a copy of Steps to Christ. God had a wonderful way to solve a problem of storage and to have each prisoner have precious literature in their possession. My name is Alan. On December 2, 2011 I began serving a jail sentence. In jail I was given Steps to Christ, and I have read it. It has been a blessing. I would like to tell you a little about myself. I was a strong member of a church, and in 2007 my wife was killed in a car accident. I stood on the road and told God that I hated Him. I said that if He was in front of me I would kill Him. The next four years of my life were a nightmare. I never found what I was looking for. I tried many different things, but could not find love. and share the faith of Jesus with them. They call me “Reverend.” I tried to teach Bible truth to them but I had no Bible. I am thankful for the Bible that I received and the other books. Now I can work for the Lord where I am. “When church members realize the importance of the circulation of our literature, they will devote more time to this work. Papers, tracts, and books will be placed in the homes of the people, to preach the gospel in their several lines…. The church must give her attention to the canvassing work. This is one way in which she is to shine in the world. Then will she go forth ‘fair as the moon, clear as the sun, and terrible as an army with banners.’”—Manuscript 113, 1901. For the first time ever, a Spirit of Prophecy book has been translated into the common language, Pidgin. Presently, 33,000 copies have been printed and are on the ship. When the brethren receive these books, namely, I Go Klostu Long Krais (Steps to Christ), they will smile all day. My name is Ifanke Obili, and I live in Papua New Guinea. Before I share my story with you, I would like to thank God for His wonderful care for each of us as we have had opportunity to share the gospel with those here in Papua New Guinea. Many people in our country are perishing without the knowledge of Christ. We need many more missionaries to go from door to door with God’s great light. It is such a joy to do what we can to reach these souls for Christ. Madang Province could only be reached by canoe. Middle Ramu District in Madang Province is one of the most remote places in our country. This district can only be reached by canoe. A call came from this area for us to share the everlasting gospel. An elder from the Kainantu church and I decided we would answer the call. We were blessed with two other missionaries joining us. The trip was long. We traveled several days by car to reach the motor canoe. It took another thirteen hours in the canoe until we reached the village. We received a very warm welcome. Our goal was to run a two-week evangelistic campaign. The meetings were held every night. During the day we started construction on a new church. The Lord blessed, and we had people come by canoe from several areas to attend the meetings. This area has Catholic and Evangelical influence. The members of these churches attended the meetings and grew in truth from God’s Word. On Fridays we went in a canoe to the market place and preached and shared God’s Word with those selling and buying goods. A church was built of native materials during the two weeks in Madang Province. After two weeks the church building was complete. We used native material and a few nails we were able to buy with money that had been given. We were able to have Sabbath worship in this church with all those that had attended the meetings and given their lives to Jesus. A meal was shared with all those that had helped to build the church and those that attended the meetings. Two of us returned to Kainantu, and the other two missionaries proceeded to another area and held meetings and built another church. There are missionaries who will keep working with the two new churches. We praise the Lord for allowing us to have a small part in this work. Please pray for us in Papua New Guinea. Marion, though not an Adventist, is an example to us of selfsacrificing service. Marion, a 67-year-old widow from Florida, was at the edge of retirement. She wanted to do something for others. So she inquired about using her skills as a nutritionist in Haiti working with undernourished children. A few months after retirement, Marion departed to Haiti where she volunteered in a feeding program that served six hundred children a week. By the time her first mission trip had ended she had used her experience to expand the feeding of children to two thousand children per week. Marion died a few years ago at age 86. Between the ages of 67 and 86 she had made forty-four trips to Haiti. In this time period she also had hip and knee replacements and a battle with cancer. 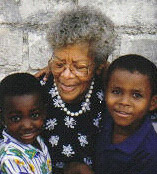 She helped establish a school for children in a city outside of Port-au-Prince, which dramatically affected the youth. She also recruited other senior citizens to join her. Her goal was to get her retired colleagues to use their life experience for something greater than winters in Florida. Let us each seek ways we can help the many needy around us. They can see God’s great love in all our interactions with them. Compiled by John Wolff. Email: johnw@tsn.cc. Marion, though not an Adventist, is an example to us of self-sacrificing service.